Here it is. 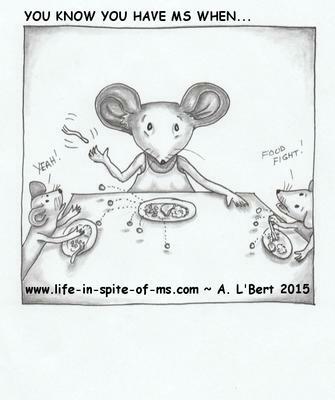 The first MS Caption Contest cartoon. What does it say to you as an MSer? Can you finish the statement - You know you have MS when...? If so, head on to the bottom and add your comment/caption. That's it - at least for now. Go tell your friends, your family, and anyone with MS to come add their caption as well. ...you look like you just ran a marathon, when you come out of the shower. ...you need to sit to change your clothes.